Large 2BR + Free Car Park/WIFI/Netflix. Walk to cafes, shops, tram & train. We have been hosting since October 2015 and thoroughly enjoy it. We constantly find ourselves brainstorming of ways to improve what we can offer; whether its that extra bit of detail in restaurant picks, to arrival tips, to fine-tuning our description so anyone new can understand why we love where we live. We also hope of course that guest see we care about ensuring their stay is as enjoyable as they can expect. We think our style is a reflection of our own travel experiences which has been extensive and at times hectic. With that, our hosting style is one where we are non-intrusive, but always respond within minutes by phone or SMS. A solution to your needs is really only a phone or SMS away. We actually enjoy being asked for recommendations, from the ideal travel route, to activities for kids, to restaurant and cafe choices. We only ever recommend places we know and not what we can search for. As such we are shamelessly biased to South Yarra area when it comes to cafes and restaurants! So if you are indeed interested to book with us, ask us for tips, before or even during your stay. We'll end here by asking you to treat our home with special care! Do take note of the house rules - strictly no partying and smoking. We love South Yarra for its charm and character, as well as the many things one can do within a short walk; there is so much choice in terms of recreation activities to parks and restaurants. And still you are so close to the city. We fell in love with this home the minute we walked in. We think its a unique combination of the house-like feel of the apartment which is set in an exclusively private building, which is so close to all the happenings of a vibrant area filled with cafes, shops and parks. With that backdrop, we definitely over-indulged in the furnishing of the apartment. The vintage office desk in front of a modern mirror is one such example. We wanted to create a unique place, one that guests would not only feel comfortable but to also treasure and remember. Basic oils, seasoning and sauces provided. Full cookware provided along with some key ingredients (oils, seasoning and sauces). Connected to Free To Air cable, and to Netflix. Free Netflix provided. Apple TV unit attached for you guest to use with their own account. Can be played in Master Bedroom TV. Small collection of DVD movies. We can organise a chauffeur airport service at a very attractive rate of around A$80 each way which would otherwise cost A$120. We thoroughly enjoyed our stay. The location is perfect.. quiet, conveniently close to everything. The apartment has special character, very spacious, lovely furniture and loads of natural light. 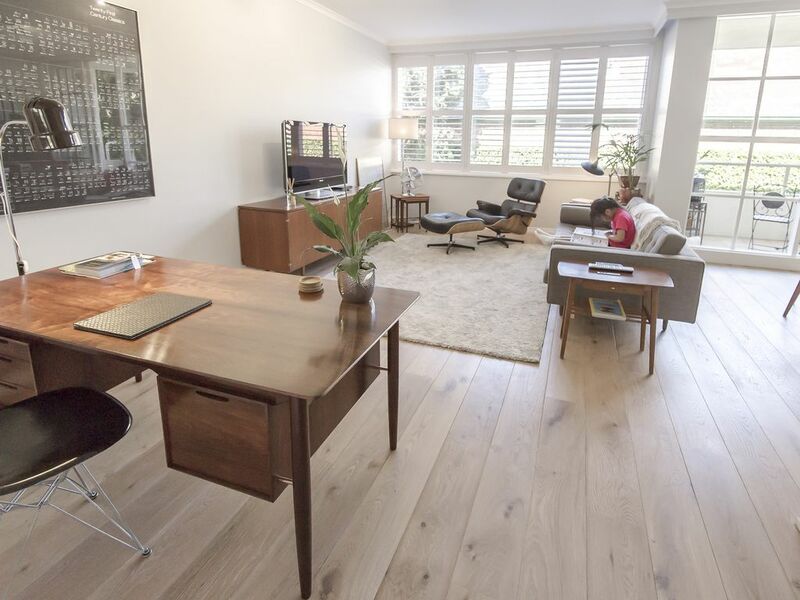 It’s perfectly located in a quiet pocket yet very close to the local gems of South Yarra... cafes, boutiques, botanical gardens, train station and trams. We loved walking in the area. The king size bed in the main bedroom is really comfortable and greatly appreciated for an extended stay. We’d love to return. Everything you could possibly need. Very clean and tidy. Close to shops, trams and restaurants and not to far from the CBD. Loved it and would stay again. We loved staying here with our children. Fantastic location (short walk to everything), very clean and comfortable (most comfortable bed I've ever slept in). We will stay here again when we return to Melbourne. Thanks for the review Kirsty. You are more than welcome again when you next visit! Cosy home away from home! Everything described in the listing is absolutely accurate. Conveniently located. Easy walking distance to shops, park, riverside. Easy access to highway to yarra valley, Philip island. Quiet and private. Will definitely stay here again on our next visit. Everything about this place is perfect! The location is ideal, walking distance to the Botanical Gardens (<10 mins), Fawkner Park (2 playgrounds within 5-10 min walk) MCG, shops, supermarket, pubs, restaurants, trains, trams and buses! We even walked downtown, which was a bit of a hike but lovely through the gardens. The place itself is lovely. We were a bit worried about having 3 young children (8,6,6) but it turned out fine. There was plenty of room and the owners even have a variety of videos (+ Netflix) and games to keep them entertained. Speaking of the owners, Paul and Pat are exactly the sort of people you want to rent from. They put themselves in your shoes and do everything they can to ensure your stay is enjoyable. The little touches are wonderful. Thank-you very much for everything and I hope that we can be back soon.